Grace O’Connor, fifth class student in Scoil Róis National School, Galway, receives her certificate of participation from NUI Galway’s Youth Academy. 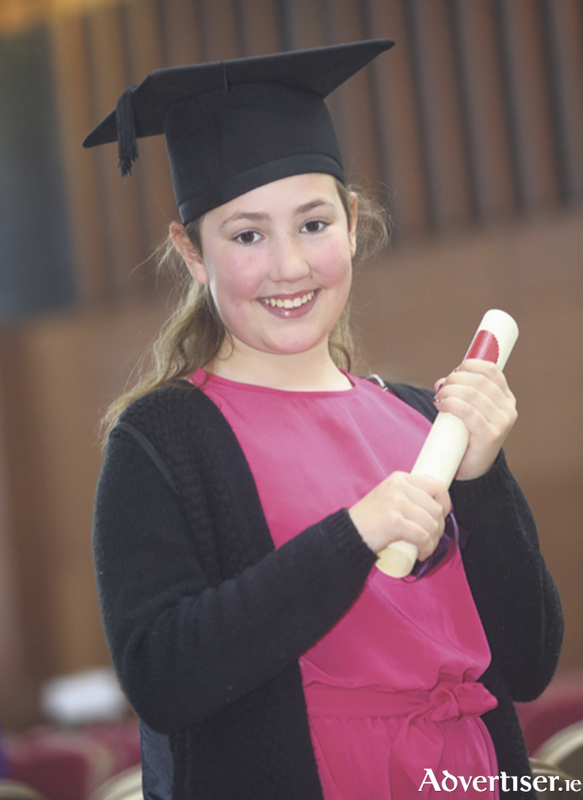 NUI Galway recently conferred special certificates on the tenth cohort of ‘graduates’ from its Youth Academy. Some 300 primary school children from across the west of Ireland received their certificates, with more than 1,000 friends and family attending the ceremony. Established in 2012, the Youth Academy aims to inspire entry to university by introducing primary school students and their families to university life. Since its foundation, 2,500 students have graduated from a variety of courses held on Saturday mornings, including Make your own Camera, Art, Engineering, Creative Writing, Eco Explores, IT, Make your own Radio Show, and Social Innovation. The Youth Academy runs for a six week period and works with high-ability fourth, fifth and sixth class primary school children to support their learning and academic development, in partnership with their primary schools. Speaking at the event, NUI Galway president, Dr Jim Browne, said the university had many initiatives where it reached out to the community. For further information on the courses and participation please contact Geraldine Marley, NUI Galway Youth Academy Coordinator, at [email protected].